Joseph Trimble Yankie joined the 141st Ohio Infantry and survived the Civil War. Joseph Trimble Yankie, born July 24, 1844, was the son of Sarah Armstrong Yankie and brother of: William Jefferson Yankie born January 6, 1834 and died June 6, 1855; John M. Yankie was born September 26, 1836; Mahala Jane Yankie, born October 4, 1838; Milton N. Yankie, born June 14, 1841; Sarah Angelina was born May 26, 1848; James Minor Yankie, born April 21, 1852 . Cheryl Cowan-Burch, granddaughter of Charles Ashton Yankie. There will be many stories that we will be sharing about the life of Joseph Trimble Yankie. As we find out more information and more artifacts, we will post them on this website. With the help of many family members, we hope to fill in many of the missing pieces of our family history. Some of the facts that we know about Joseph Trimble Yankie, was that he was born in Adams County, Ohio on July 24, 1844. After his military time spent in the Union Army during the Civil War, Joseph Trimble Yankie and his cousin John Swisshelm, and his brother, James Minor Yankie left to seek their fortunes in the Wild West region of territorial New Mexico. His direct descendent has a copy of his military release signed by President Abraham Lincoln and will be posted on this website at a later date. Once they arrived in New Mexico, they did some farming in the southwest portion of the state. But that is not what Joseph Trimble Yankie was to be remembered for. Two prospectors staked a claim and soon found gold along the Mimbres Mountains beside a stream named Percha Creek. Word spread quickly and this area soon became a mining boomtown with no name. There are a couple of stories on how the town finally arrived at the name Hillsboro, New Mexico. The first was that the resident miners coldn't decide on what the town should be called, so everyone put their suggestions into a hat. Another account was that Joseph Trimble Yankie had the privilege of naming it after his hometown in Ohio after he found an unusually large gold strike. In 1870, he later left for a remote section of Arizona called Clifton-Morenci with his cousin, John Swisshelm and a new partner, Jim Bullard. There, they discovered a rich copper ore strike and also found gold in Gold Gulch, which is located about a mile west of Morenci. Taking samples of the ore with them, they traveled back to Silver City, New Mexico to seek investors. These investors went back to Gold Gulch, but found the water in the area too "coppery" to sustain them for extended periods of time. They had to abandon the area when they ran short of food. In 1872, Col. William Ryerson, Jim Bullard, and Joseph Trimble Yankie went back to Morenci and staked their claim. Ore samples were later sent to Detroit, and the claims were sold to Eban B. Ward, a wealthy steamship owner. Ward sent out a retired ship captain, Miles Joy, to oversee the Copper Mountain Mining District and elected Joe Yankie as its president. Joseph Trimble Yankie later returned to his birthplace in Ohio and married Margaret Vinton Patton on November 11, 1884, and raised his family there. Their son, Richard Leroy Yankie was born June 18, 1887. 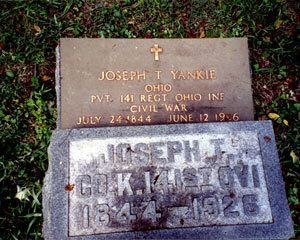 Joseph Trimble Yankie died June 12, 1926, and is buried in Adams County Ohio. A family tree helps put Joseph T. Yankie in perspective with the rest of the family. Greetings from the Hillsboro Historical Society. Hillsboro, New Mexico, had its own 9/11 events -- in 1879 and 1885 -- the latter being the original "operation Geronimo" that involved a future Supreme Court Justice. When passing through town, be sure to visit the free Black Range Museum (donations encouraged).